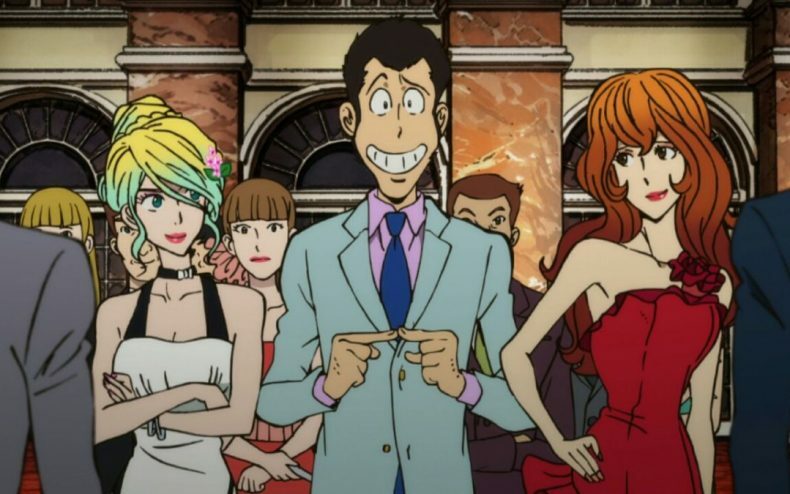 Lupin the 3rd, one of Japan’s most recognizable cartoon characters, turns 50 years old this year. First appearing as a manga in 1967, the first Lupin TV series aired on Japanese television in 1971. Lupin’s first aired appearance on US television was decades later on Adult Swim, unless you want to count that time he was renamed “Cliff Hanger” and spliced into a Dragon’s Lair-like laserdisc arcade game. Lupin doesn’t show up on American TV often. But this is one of those times! Lupin the 3rd Part 4 will begin airing this summer on Adult Swim’s Toonami block. There is a new message from Lupin the Third, but this time, he is not announcing a heist. Instead, it is an invitation to his wedding. He is marrying the young and famous tabloid queen, Rebecca of the wealthy Rosselini conglomerate. Lupin’s true motive behind his nuptials is to steal the Libertas crown, also known as San Marino’s national treasure. The crown can only be seen in public during the marriage ceremony. As Lupin attempts to steal the crown, his arch-nemesis Inspector Zenigata is ready to pounce, having been tipped off about Lupin’s heist. Meanwhile in Rome, a skilled spy from the English secret service, MI-6, who has been solving variety of unknown incidents around the world, finally manages to corner Lupin. It is revealed that MI-6 has been secretly investigating something known as the ‘Dream of Italy’, which is somehow related to a tragic secret love affair from Rebecca’s past. As Lupin deals with a motley crew of unique characters that come his way, an extraordinary genius that lived centuries ago steps out of history into his life. The story that began in San Marino now expands all over Italy as Lupin pursues love and freedom in this exciting new adventure. According to TMS the English dub will be exclusive to Toonami — only the subtitled version is available on Crunchyroll. Which is fine with most anime purists anyway.